With 19 locations nationwide (and growing), SPIN! features a distinct, inviting atmosphere that appeals to all ages and is known for its exceptional, artisan food made from fresh ingredients, and eclectic, affordable premium wines. SPIN! 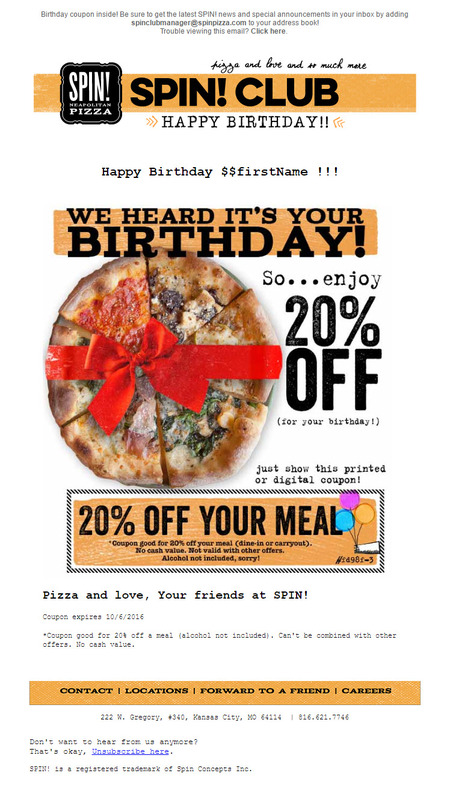 Pizza loves to spoil their customers on their birthday with 20% off the meal or pizza of their choice. Prior to using the emfluence Marketing Platform, the SPIN! team was manually sending batched emails each month. By automating the email on a daily schedule, SPIN!’s marketing team immediately saved a lot of time, plus they were able to send the coupon on customers’ actual birthday with no additional effort. The hand-stamped look of the email creative represents SPIN!’s hand-made mantra. The coupon outline at the bottom helps customers see right away that they can show this email to redeem. An email is automatically sent at 9:00 AM on a club member’s birthday, based on the birth date they added when they created their account. The email offers 20% and a dynamic expiration date of 30 days after the email is sent, so they don’t have to come in on their birthday to redeem.